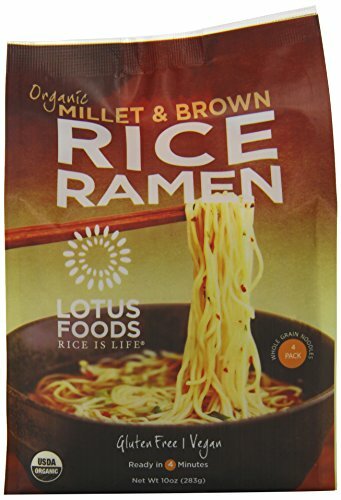 Lotus Foods brings you Millet & Brown Rice Ramen, traditional Japanese-style noodles made from our specialty rice instead of wheat! In addition to being gluten free, millet and brown rice are some of the most nutritious and easily digestible grains.Our Millet & Brown Rice Ramen has a delicious nutty taste and is a good source of fiber and protein. Ready to eat in just 4 minutes! Add to soup or miso for a quick bowl of flavorful and nourishing noodles any time. For a complete meal, use Ramen in your favorite stir-fry, or enjoy a cold noodle salad with a simple tamari and sesame oil dressing. Great for home consumption or at restaurants and cafes. If you have any questions about this product by Lotus Foods, contact us by completing and submitting the form below. If you are looking for a specif part number, please include it with your message.